We’d love your help. Let us know what’s wrong with this preview of The Carlswick Deception by S.L. Beaumont. A priceless Shakespearean First Folio is stolen from an English manor house. Oxford student Stephanie Cooper is drawn into the dangerous criminal world of art theft when she meets attractive young detective Luke Spencer. As her rock-star boyfriend tours Japan with his band, Stephanie and Luke's quest becomes personal as they follow an increasingly perilous trail that leads from Oxford to London, Paris and Venice. But when Stephanie takes an unnecessary risk, the stakes turn deadly. Can she stay alive long enough to expose the identity of the thieves, help recover priceless literary works and resolve her conflicted feelings for Luke and her boyfriend James? To ask other readers questions about The Carlswick Deception, please sign up. I received this book for free from Author (via YA Books Central) in exchange for an honest review. This does not affect my opinion of the book or the content of my review. 'The Carlswick Deception' is a series of mystery/detective. Each novel can stand alone as back story is given about what happened previously in the series. Stephanie is an art history student at Oxford. In the past she had an internship with the arts and antiques unit at Scotland Yard. In 'The Carlswick Deception', Stephanie is called by Scotland Yard to show a detective around Oxford in relation to a case. Of course soon Stephanie becomes involved in said case. I love mystery/detective stories. However, sometimes I find the main character detectives to be somewhat dull and boring. This was not the case in the 'The Carlswick Deception'. I found the character of Stephanie interesting and very charismatic. I also love the character of Luke, the detective Stephanie is working with. I, however, am not a fan or her boyfriend James. He seemed rather dull and kind of wishy-washy. I also find it as a stretch with the police letting a college student help investigate such high stakes crimes (including interviewing witness, and following felons etc) .This seems to be a trend of British detective stories involving a lay person as detective (Agatha Raisin, Grantchester, Father Brown etc.) They also rely less on forensic science and more of old-fashioned detective work. I loved the settings of 'The Carlswick'. The story sent the characters from Oxford, to London, to Paris, to Venice. I thought the descriptions of historical sites in each city were a wonderful aspect of the story. I particularly love the inclusion of the Sainte-Genevieve Library. I have never heard of it before and the descriptions were absolutely beautiful. My favorite aspect of the 'Carlswick Deception' is that it centers around rare pieces of literature. The story included all sorts of back story on rare pieces . (For example I had never heard the story of Earnest Hemingway's stolen manuscripts). I was delighted to be given an advance copy of The Carlswick Deception by S L Beaumont in return for an honest review. This is the forth in a contemporary, young adult mystery series and is just as original and engaging as the previous three books. Now, I am very aware that I am not the target audience and there are elements, which were too young for this 38-year-old, but I do love a good quality young adult book and The Carlswick Deception certainly didn’t disappoint. Here is a little backgroun I was delighted to be given an advance copy of The Carlswick Deception by S L Beaumont in return for an honest review. This is the forth in a contemporary, young adult mystery series and is just as original and engaging as the previous three books. Now, I am very aware that I am not the target audience and there are elements, which were too young for this 38-year-old, but I do love a good quality young adult book and The Carlswick Deception certainly didn’t disappoint. Here is a little background to the series so far- without giving too much away! The main character, Stephanie, has been described by some as a modern-day Nancy Drew and I think this is a great comparison, especially as I love Ms Drew still. The story begins with Stephanie moving from New Zealand to England in order to spend more time with her father and to study at Oxford. She spends the summer before university with her grandmother and connects with an up and coming indie band member, James, in the village. It turns out that there is a feud between the two families, going back to events in World War 2. The mystery then revolves around stolen German art from that period and a connected mysterious death. The next two books continue along this art history theme with lots of twists and turns as well as how Stephanie and James navigate their relationship as Stephanie begins university and James’ band career takes off. The Carlswick Deception moves on from art history to priceless literary works. Stephanie takes on a summer job working with the police, as part of a stolen art recovery unit. A precious Shakespearian First Folio is taken as part of a robbery, which turns out to part of a larger operation. There is trouble afoot with James, as they struggle to find time for each other and a rather handsome young detective in the picture too. Throw in that that the plot takes part in Oxford and Venice and you have a fantastic summer read. I think that Beaumont’s use of art and literature as the basis for her mysteries is refreshing and certainly well researched. She pays great attention to detail in subject matter and in her setting descriptions. I do like how different countries are woven into the storyline too and Beaumont’s clear love for these countries is contagious. I love Stephanie for her fierce independence, her curiosity and intelligence. I also like how her character is developing throughout the series and I’m really looking forward to seeing where Beaumont takes her next. My problem with the genre of YA fiction is that it is quite often dominated by a selected few, well-known names and that lesser known authors are sometimes not given the recognition they deserve. S L Beaumont’s books are currently a bit of a hidden treasure and I’m so glad I stumbled upon them. I do enjoy a good thriller. I like them fast-paced, populated by strong, interesting characters, and, of course, it must have a twisting plot and a killer of an ending. I’m delighted to say The Carlswick Deception by S L Beaumont pretty much ticked every box. So, let’s begin by discussing the plot. Basically, if follows a university student on an adventure to recover stolen art; in this case, a very old manuscript. She’s helped by a detective by the name of Luke. What follows is a pacey thriller, packed full of twists and turns – oh, and pretty exotic settings. There’s plenty happening here to keep any mystery/thriller fan turning the page. Personally, I enjoyed the last third of the story the most. It is by far the most intense, ending big and exciting, as any good thriller should. The hero of the story, Stephanie, is an interesting character, perfectly cast as a strong, female sleuth. But she’s also vulnerable, open-minded and up for facing a tough challenge. But it’s the young detective, Luke, who I took a shining too. I think I might be a little bit in love! The writing style works well for this genre. It’s not Hemmingway; you never think, ‘WOW! That character just jumped off the page.’ But that’s okay. The author keeps the focus on the plot, keeps things moving and, most importantly, keeps surprising the reader whenever she can. So, which book is this similar to? Well, it’s sort of like Clive Cussler’s Dirk Pitt books but with a female hero. Or, if I was comparing it to a film, National Treasure. I would recommend it to anybody who enjoys a light adventure with plenty of character chemistry. This review has been hidden because it contains spoilers. To view it, click here. I just read the 4 books in a row, so will try get my thoughts out while they're still fresh. The writing style dramatically improved after the first novel and has continued to evolve into something with substance. Gone are the annoying kiwi-isms and unnecessary fluff about shoe collections, for the most part, at least. There's still a little too much over-describing of outfits, meals, trivial things - the scenery details are so well-written, I wish the whole story was of that caliber. Truth be tol I just read the 4 books in a row, so will try get my thoughts out while they're still fresh. Truth be told, I'm not a huge fan of Stephanie as a character, but she's growing on me. She has the makings of everything I like in a protagonist (strong, independent girl-detective etc), so I'm not sure what doesn't sit right with me. It may just be that it's hard not to imagine an awful NZ rising inflection accent whenever she's speaking. I spent the last half of the book waiting for Luke to be a dirty cop, and was deliriously happy when the trope was avoided! Yay! It was also refreshing to see Stephanie buddy up with a new character. Honestly, I think the story was better because there was less James. The parts set in Venice were the low-point in the book. Girl, why are you even with him at this point? You're only 20, there are plenty of fish in the sea! I think their relationship fell apart for me in the third book. Once removed from Carlswick, they seem like a terrible couple. I'll read the next book that comes out in the series, but suspect I'll be disappointed and may have to call it a day. I really like the more "grown up" direction that the series has headed towards, and almost wish things had been split up differently. Maybe 3 trilogies. Eg. Stephanie and James split amicably after New York, she joins Scotland Yard permanently a few years later - partners up with Luke, another few years down the track they part ways and Stephanie returns to Carlswick and reconciles with James. Steph, a young Oxford history student spent her recent summer holiday helping out a team from New Scotland Yard with an art theft case. She became known to a senior officer of the Yard who helped out when she got mixed up in a case concerning her rock-star boyfriend’s (James) older brother (Alex) in New York. She is now back at university for her second year, when she gets a call from the officer asking if she could help out one of his team to navigate around Oxford. She thinks it will give her Steph, a young Oxford history student spent her recent summer holiday helping out a team from New Scotland Yard with an art theft case. She became known to a senior officer of the Yard who helped out when she got mixed up in a case concerning her rock-star boyfriend’s (James) older brother (Alex) in New York. She is now back at university for her second year, when she gets a call from the officer asking if she could help out one of his team to navigate around Oxford. She thinks it will give her an hour off from trying to finish some assignments and agrees. The young officer who arrives, Luke, is attractive and quite likes Steph. She has to show him to the English department for a meeting with one of the heads. While waiting outside, Steph witnesses what may have been a murder and gets drawn further into the case. They go to the nearby site of the theft of a priceless Shakespeare First Folio to look around the crime scene. The elderly owner was murdered when the theft took place. The trail then leads to Paris, where Steph has gone to visit a friend, while her boyfriend is performing over in Japan. Further twists take the story to London and also Venice, where you get to meet some of her boyfriend’s family. Are they mixed up in any of this? It’s a twist you have to wait and find out about. Steph tries to follow up on something and places herself in danger. Luke is never far away and the lines start to blur between Luke and Steph, while James is away. Jealousy can lead to the wrong decision. She needs to make up her mind on her feelings towards them both, but the case and distance keep getting in the way. This was a really enjoyable and quick read – mainly because it kept you interested and engaged the whole way through. I would love to read some of the other books in the series. This is the fourth book in the series, but each can be read as a standalone book. I received an ARC copy of this book from Hidden Gems and I have freely given my own opinion of the story above. Think Nancy Drew for an older audience!! I am super excited that more authors are diving into the YA mystery genre. While this book can be read as a standalone, I wouldn't recommend it, as I felt I missed a lot of explanation in James' family dynamics and James and Stephanie's relationship. As it was, I couldn't understand what they saw in each other and felt they didn't have much chemistry in any department other than the physical. (Nothing explicit, just kissing and cuddling.) But I found myse Think Nancy Drew for an older audience!! I am super excited that more authors are diving into the YA mystery genre. While this book can be read as a standalone, I wouldn't recommend it, as I felt I missed a lot of explanation in James' family dynamics and James and Stephanie's relationship. As it was, I couldn't understand what they saw in each other and felt they didn't have much chemistry in any department other than the physical. (Nothing explicit, just kissing and cuddling.) But I found myself confused as to why Stephanie liked this guy when there was CLEARLY a much better option who was into her. There was a lot of description of the places Stephanie went, including street names and courtyards and gardens that I just couldn't really appreciate, as it seemed to cater to an audience who knew these places well and would have possibly enjoyed the details. BUT! What I did like was the mystery! Rare manuscripts being stolen, Stephanie involving herself in dangerous situations (being the young, impetuous detective that she is), a smart, swoon-worthy cop, and the final reveal of the criminal mastermind! Plus, the cover of this book is FANTASTIC. 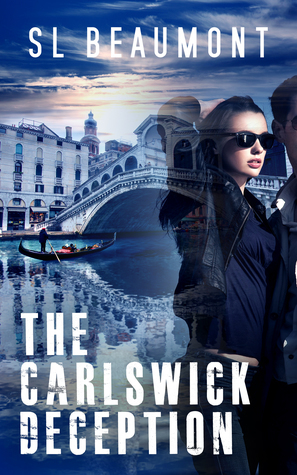 The Carlswick Mysteries are a series of young adult novels (THE CARLSWICK AFFAIR, THE CARLSWICK TREASURE, THE CARLSWICK CONSPIRACY, THE CARLSWICK DECEPTION and THE CARSLWICK MYTHOLOGY), this one being the fourth in the series. There is some back-story woven into each of the books to assist readers in not needing to start from the very beginning, although my advice would be to go back to the start as there appears to be a lot that's happened between Oxford student Stephanie Cooper and her rock-st The Carlswick Mysteries are a series of young adult novels (THE CARLSWICK AFFAIR, THE CARLSWICK TREASURE, THE CARLSWICK CONSPIRACY, THE CARLSWICK DECEPTION and THE CARSLWICK MYTHOLOGY), this one being the fourth in the series. There is some back-story woven into each of the books to assist readers in not needing to start from the very beginning, although my advice would be to go back to the start as there appears to be a lot that's happened between Oxford student Stephanie Cooper and her rock-star boyfriend, James. Young adult styled, with the emphasis leaning slightly towards telling, rather than showing, the rock-star lifestyle is what's needed to bring student Stephanie into contact with a range of possible mystery scenarios. In this case, the theft of a priceless Shakesperean First folio, flinched from a stately mannor, which results in a murder, and Stephanie's meeting with a particularly attractive young cop. Lots of glamorous lifestyle, bit of romantic tension and an English country manor into the bargain, this is a series that may appeal to young adults (women in particular) looking for a spot of escapism. This is an interesting and well paced police procedural, and a standalone in the Carlswick series. I haven't read the previous books so felt a little lost at times, I needed more background information. The characters are both believable, and likeable, especially Steph, Luke, and James, although the latter appears mainly through phone calls and texts. The various cities where the action takes place, Oxford, London, and Paris,are well described, and the unique atmosphere of each one really comes acr This is an interesting and well paced police procedural, and a standalone in the Carlswick series. The various cities where the action takes place, Oxford, London, and Paris,are well described, and the unique atmosphere of each one really comes across. Multiple mysteries abound in this British Nancy Drew goes to college tale. Thanks to a prior internship at Scotland Yard, Oxford art student Stephanie gets involved once again in a murder mystery involving a mysterious First Folio. While there aren't any big surprises, Stephanie's investigation and real life romantic woes are entertaining and keep the plot moving. Bonus points to Beaumont for naming her policemen Marks and Spencer! I received an advanced copy of this book, and have avidly read it since . I was excited to reconnect a with the story again but was met with a different theme. Relationships and unsaid attractions rose to the fore, making for an interesting read. I feel that this series is not yet finished and look forward to reading the next book. Well dine. Romance, theft and just the right amount of suspense to make a perfect book. My first read from author S.L. Beaumont and we have a winner! Well written, fast paced, intriguing storyline. I can see me reading more from this author! SL Beaumont is the author of the young adult romantic mystery saga, The Carlswick Mysteries. She lives in beautiful New Zealand with her husband, three teenage sons and an enormous fluffy cat. Her passion for travel has seen her take many long haul flights from New Zealand. Her love of history helps determine the destination and the places she visits are a constant source of inspiration for her. S SL Beaumont is the author of the young adult romantic mystery saga, The Carlswick Mysteries. She lives in beautiful New Zealand with her husband, three teenage sons and an enormous fluffy cat. Her passion for travel has seen her take many long haul flights from New Zealand. Her love of history helps determine the destination and the places she visits are a constant source of inspiration for her. She is a Chartered Accountant by day, having worked in London, New York and Auckland, and an author by night. The titles in The Carlswick Mysteries series have been awarded honorable mentions at the San Francisco and New England Book Festivals and the most recent release was a finalist in the Wishing Shelf Book Awards.